Books are such a great gift for baby showers, aren't they? I mean honestly, especially when I was about to have my first child, I had been out of the world of board books for so long. Having a couple of really good ones handpicked by friends was totally great. That was how I discovered Sandra Boynton! I don't even remember who it was that gave me her book Barnyard Dance, but I'm forever indebted. 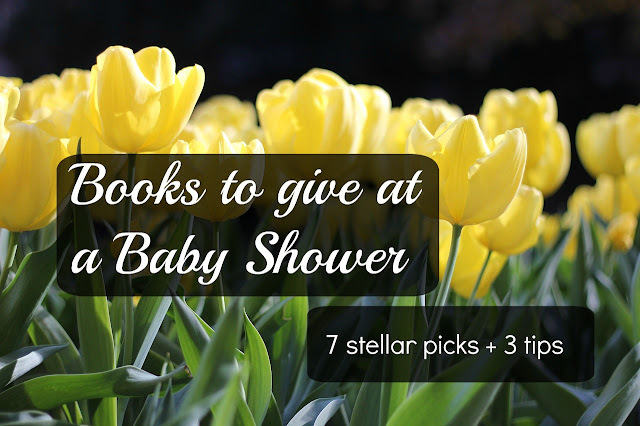 I've shared some book recommendations before, for those who want to give a book at a baby shower. (That post is here.) But what makes a book a good choice for a shower gift? It's got to be enjoyable for the parents to read. Parents will be reading this book for years before the baby-of-honor can read independently. It's got to be developmentally appropriate. Rhyming develops kids language skills. Picture cues and repetition help them learn to read. High contrast helps with eye development. It's best if they don't already own it. Obviously. 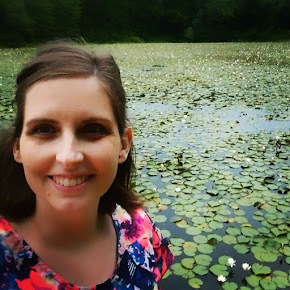 With those guidelines in mind, I teamed up with Michelle, a friend of mine who was in 4-H with me back in the day, and is now an Usborne Books consultant. My recs link to Amazon, and hers link to her Usborne page. Here are the recommendations we came up with! Time for a Hug - A mama rabbit and her little bunny spend the day together doing all kinds of things, and pausing frequently for hugs. This one will grow well with a child. It's fun to read to them, and also a good one for them once they begin to read. I discovered it through Bookroo (a monthly box that sends either board books or picture books). I wrote more about Bookroo here, and Bookroo would also make a great shower gift! Little Blue Truck - A friendly truck helps others, and later gets the help that he needs. I discovered this book when I was shopping with my friend Nicole and she started gushing about how much her toddler loved it, and saying that she enjoyed reading it to him. I gave it to Camille at her baby shower this past year and a few weeks ago she told me, "I have to tell you, that is my son's favorite book!" How Many Kisses Do You Want Tonight? - Different animals each ask their babies how many kisses they want, and the book counts from one to ten. My kids (ages 5 and 2) love this book so, so much. I give it the side eye a little bit, just because some of the featured animals don't actually care for their young. But I recommend it anyway because it gives me a chance to talk about that with my older kids, plus it's so sweet and the rhyme scheme is very nice and it always ends in kisses. Moo Baa La La La - Animals each make their sounds. I decided I couldn't just say ALL Sandra Boynton books were perfect shower gifts, because that's not helpful if you're just trying to pick one. This one is a super solid choice and is still a pleasure to read even though I've had it for years and years. 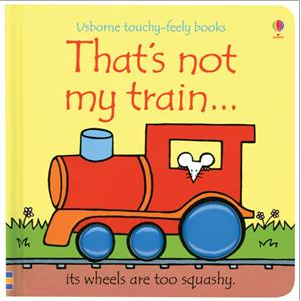 That's Not My Train - Any of the board books in the "That's Not My..." Series are great. These books have bright, bold, pictures and touchy-feely patches on every page. The pages are really thick and durable! My baby has loved them ever since he was just a couple months old and my three-year-old loves them too because he can "read" them since they have a predictable pattern. (That's not my train, it's roof is too rough..., that's not my train, it's wheels are too squashy...). There are over 30 in the series. 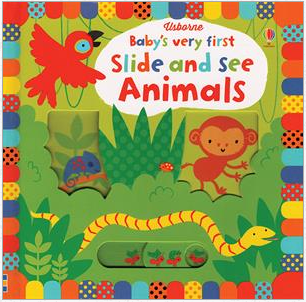 Baby's Very First Slide and See books - There are three titles in this series: Under the Sea, Animals, and Farm. These are really fun and interactive. They have pieces that slide, finger trails so that little ones can practice fine motor skills, and bright pictures! This is another book that has kept my son's attention since he was a newborn! 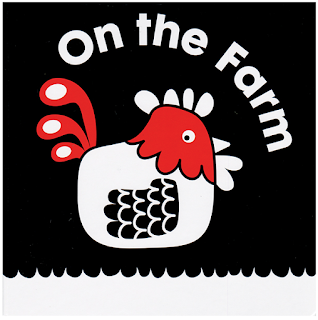 On the Farm - This is a fold out board book so it is perfect for brand new babies! You can stand it up on the floor and they can look at it while they do tummy time. It's color on one side and black and white on the other. My one-month-old nephew is already enjoying this book, but my three-and-a-half year old likes it too! Usborne has a similar book called 123 Counting. Michelle even has a video of herself talking about these awesome books. The whole thing is five minutes, but she covers these three books in the first two minutes. I loved seeing the slides in action! If this list is missing a great book, please add it in the comments, below! And I'm curious: If you've been on the receiving end of a baby shower, what was your favorite gift? My favorite non-book gift might have to be the Mei Tai carrier some friends got for me. I like it a lot. The going to bed book by Sandra Boynton is one of our favorites to give. I love that one, too! I think I got it as a baby shower gift, even. :) Totally adorable. Great list! Some of these I haven't read, so I'm excited to go check them out now...although my youngest is 4. :) It's all good. He will love it, I'm sure! We also really like the "How do Dinosaurs..." books by Jane Yolen. There are several--"How do Dinosaurs Count to 10?" is a favorite. Thanks Linnae! And yes, in my experience, 4 year olds still love board books. :D The Jane Yolen Dinosaur books are adorable. Good recommendation! I don't think I've read "How do dinosaurs count to 10" yet, so I'll have to check it out.